As it often happens in academic journal publishing my latest article From Social Movement to Ritualized Conference Spaces: The Evolution of Peace Research Professionalism in Germany has been work in progress for quite some time. This is the final product based on my doctoral research project. The article takes a qualitative-historical approach to investigate how discussions, gatherings and discourses of peace research in Germany have been transformed over time into ritualized events. Over time, traditional ideas of open and inclusive debates within a social movement have been replaced with the rituals of the academic conference industry. 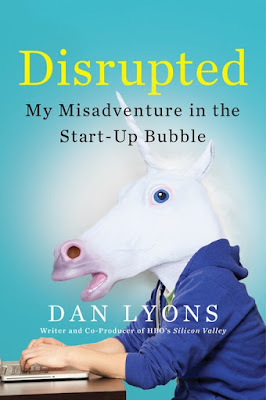 I picked up Dan Lyons’ book Disrupted-My Misadventure in the Start-Up Bubble because of my general interest in insights from other sectors and industries that may help us to understand the future of ‘our’ aid industry better. My first book reviews dealt with the ‘outside world’ and historical developments elsewhere and Disrupted is a good book to take up my reflections again on the future of work, corporate culture and the changing nature of what professions and careers might look like in the near future. Development news: Save The Children’s Saudi connection; the dark side of development communication; USAID shows a sense of humor; more futures of humanitarianism; child labor; UK spends aid money to support private schools; can RCTs become political? ; poverty is not a lack of character; new aid work(er) movie. Our Digital Lives: Spoof TED talk on thought leadership; are fast food restaurants the new community centers? Newsletters for community building; a lot of media people to avoid #allmalepanels. Academia: Sounds like an experiment: How husband and wife started in academia and how their careers were impacted by gendered assumptions of the industry; PhD students and critical thinking; despair fatigue. In a long interview with the Swiss Neue Zuercher Zeitung (NZZ) (in German) Noble laureate Angus Deaton confirms that he does not like aid. Some of the better World Bank staff say "We know how to build accountable institutions. If a country wants to have them, they can ask us for advice". Maybe that is a way to really help. Q: That would be a new role for the World Bank. Greetings from Berlin! While catching up with friends I am finalizing this week's link review. Development news: Global aid spending is a mess; an overview over adaptive learning networks; Ethiopia's climate crisis; Nepal-as always on the edge of failure; top UN whistleblower resigns; the power of status quo UN bureaucracy; changing aidwork in rural Kenya; Gates foundation fails U.S. public school policy-making. Our digital lives: Start-ups are addicted to jargon; an artistic research podcast on lifelogging. New publications on refugees and mobile communication; social media ethnography from the Chilean periphery. Academia: The complexities of conferencing in and on 'Africa'; the stupidity of the knowledge economy. Angelina has kept me busy as you can see below, but obviously I have come across a few more interesting readings for your weekend pleasure and critical reflection. So what questions do you want to engage with this week? Is the fishermen-use-mobile-phone ICTD success story a myth? What kind of new NGOs do we need post-WHS? Why do we need ICT in evaluation? Why doesn’t UNDP like critical staff members? Why do super-highways contribute to inequality? Does anybody care about Clintons’ flawed engagement in Haiti? Is OK to have orphan hero shots in your NGO communication? How should you blog development? Should academics be expected to change policy? Should you provide expert input for free? Should professors decide about textbooks?